Stainless steel countertops can brighten up any room, reflecting natural and artificial lights as well as color. Stainless steel counters provides a clean, elegant look that is ideal for food preparation. It is a very durable and long lasting surface, easy to clean and heat and stain resistant. However liquids or food particles left on stainless steel countertops for prolonged periods of time can cause damage. It is not recommended to use bleach or abrasive cleansers on stainless steel. If bleach does come into contact with your stainless steel counters, rinse thoroughly with water immediately and towel dry. Please call APL Fabricators & APL Stone at 651-438-2223 for more information on our stainless steel products and prices. 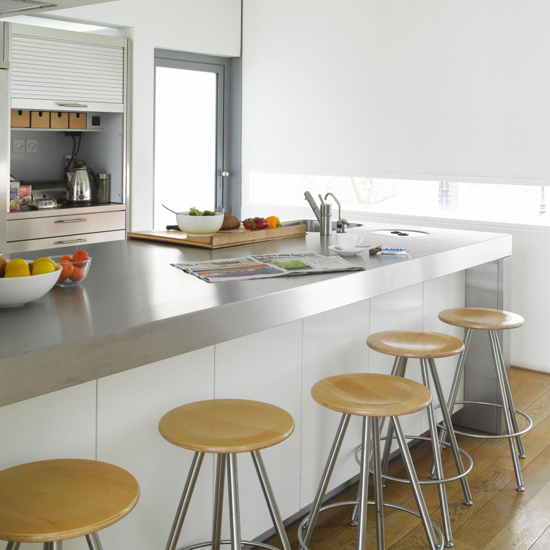 We’d be happy to discuss your countertop needs and help you decide if stainless steel is right choice for you.